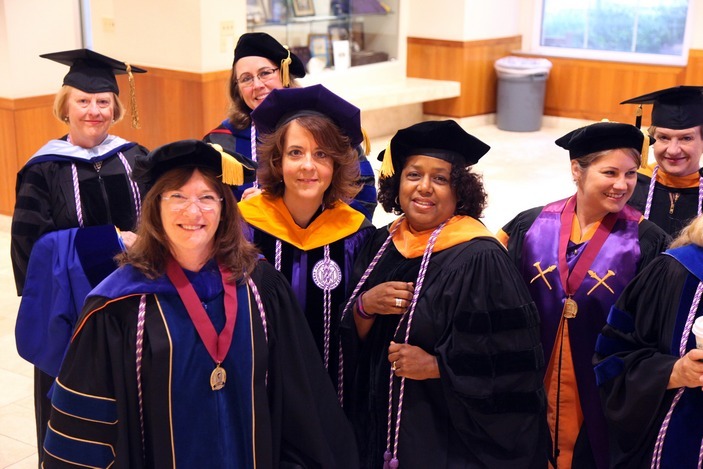 (from left) Faculty members Dian Evans, Suzanne Staebler, Lisa Muirhead, Carolyn Clevenger, and (back, from left) Rebecca Gary, and Carolyn Reilly before the School of Nursing Diploma Ceremony at McDonough Field. 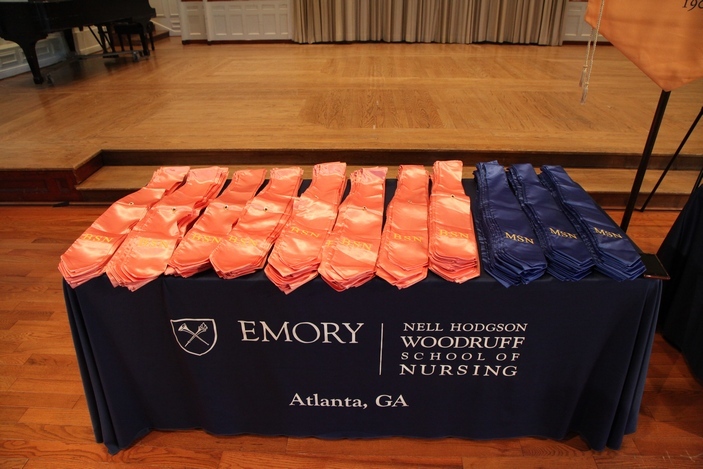 The Nell Hodgson Woodruff School of Nursing celebrated its 110th diploma ceremony May 9, 2016, at McDonough Field. Hundreds of family and friends gathered to support the 273 students who earned diplomas this spring. 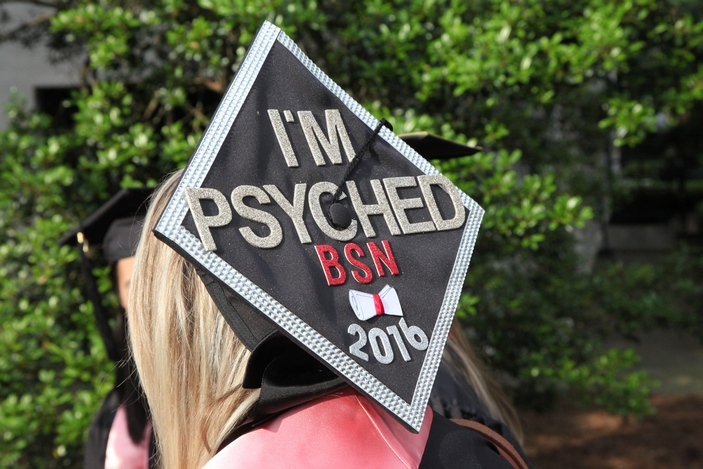 This year’s graduating class included three PhD graduates; 112 BSN graduates; 17 Accelerated BSN graduates; 90 MSN, and 46 Accelerated MSN graduates. Seven students graduated with a perfect 4.0 average. 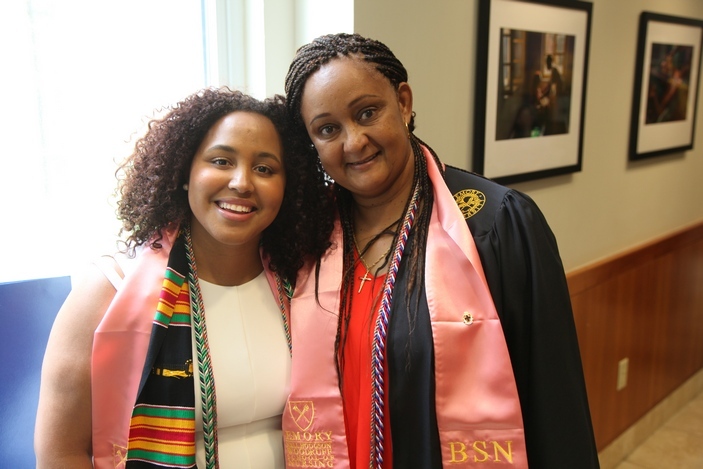 Fifty percent of the students in the Class of 2016 participated in global health programs through the Lillian Carter Center for Global Health & Social Responsibility. 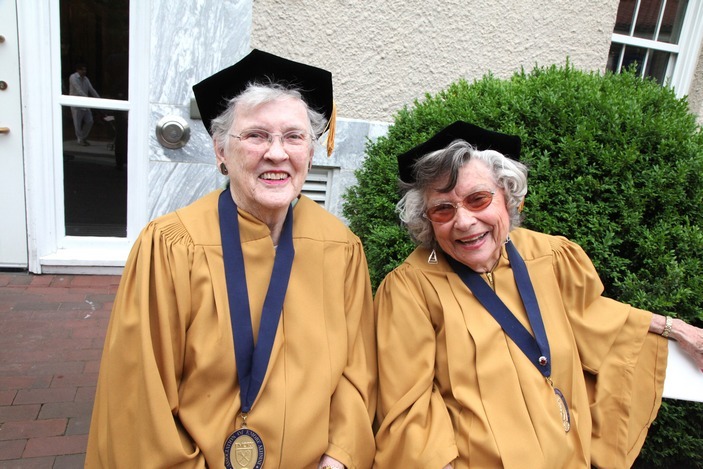 These students now join a family of more than 7,000 School of Nursing alumni living around the world. 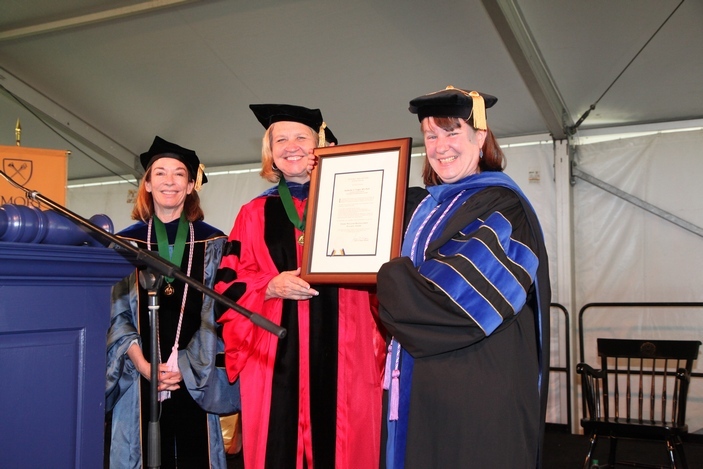 During the ceremony, Dr. Kate Yeager was recognized with the Emory Williams Award for Distinguished Teaching. The University gives this award to an outstanding faculty member in each of Emory’s schools. 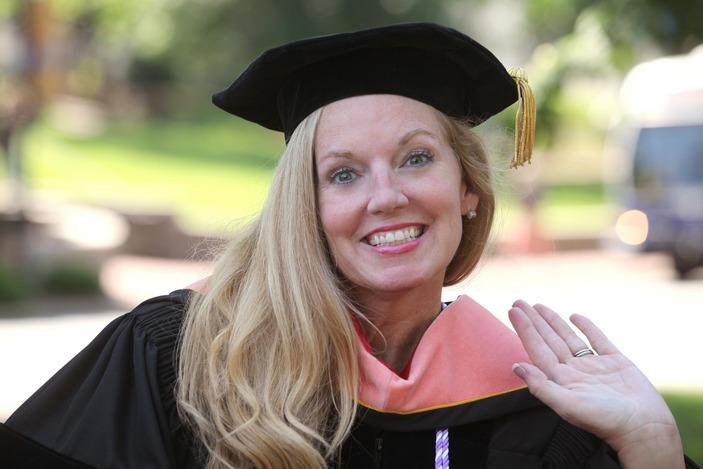 Dr. Yeager was honored for her commitment to students and academic excellence. Dr. Yeager has dedicated her professional career to addressing health disparities. Her current research focuses on improving the pain experience for African Americans with cancer. She is a co-advisor of the Emory Multicultural Nursing Student Association and a faculty representative on the School of Nursing Diversity Taskforce. On a national level, Kate serves as co-chair of the Health Disparities Committee for the National Cancer Institute-sponsored NRG Oncology. Chuncey Ward, was recognized as the School of Nursing’s 2016 Boisfuillet Jones Medal winner. 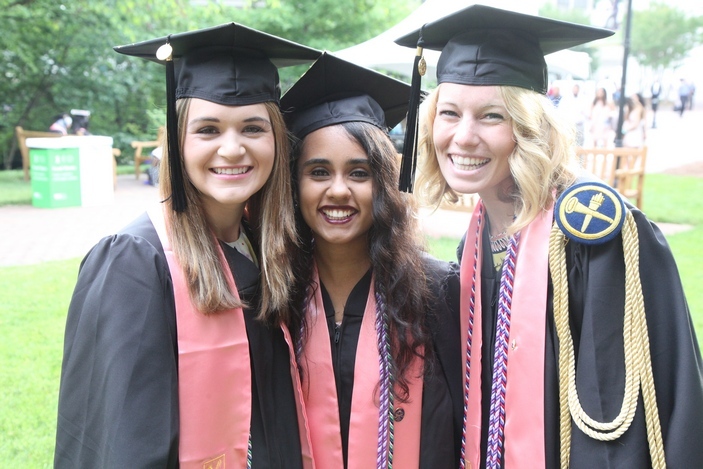 This award is given annually by Emory University to one senior in each undergraduate school who exemplifies leadership and service. 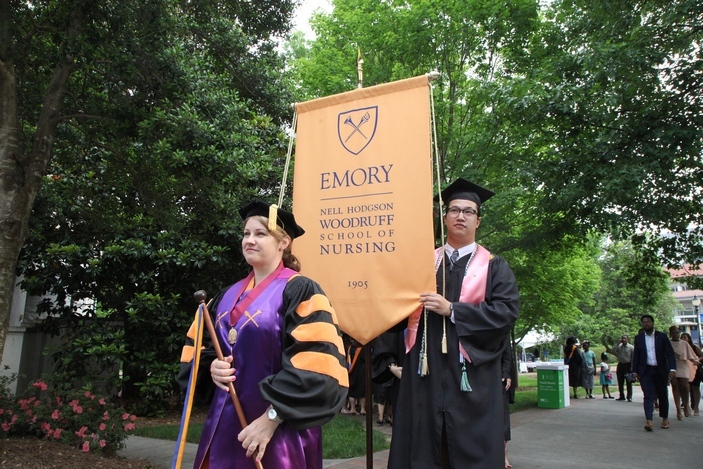 Chuncey served as president of the Emory Student Nurses Association, a Student Ambassador for the School of Nursing and represents the student body on the board of the Emory Nurses Alumni Association. He is a Veterans Affairs Nursing Academic Partnership Scholar and serves as co-editor of the program’s newsletter. 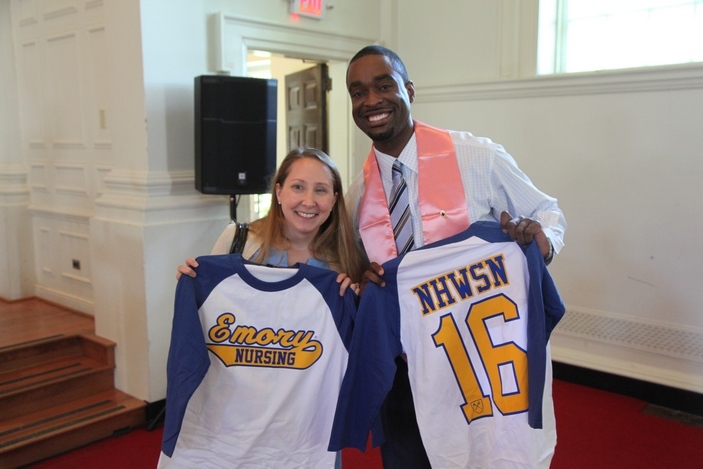 In addition to his service on campus, Chuncey volunteers for several community organizations, including the National Black Nurses Association Institute, Gateway Shelter for the homeless, Clairmont Place Independent Retirement Community, and the Emory Autism Center. 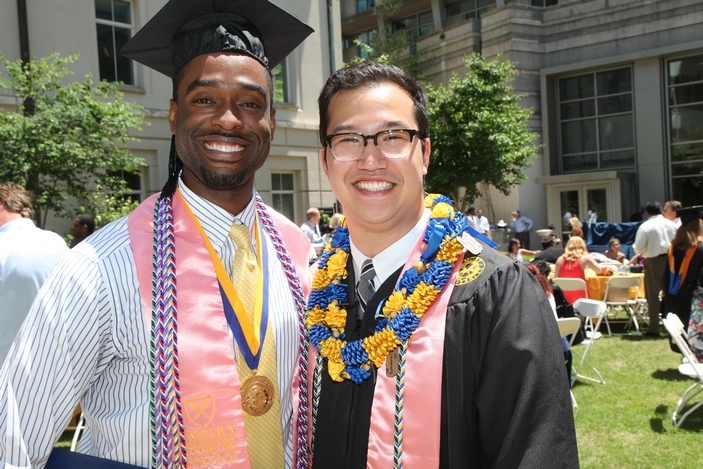 The Commencement ceremony was the final event of a weekend that celebrated the achievements of the graduating class. 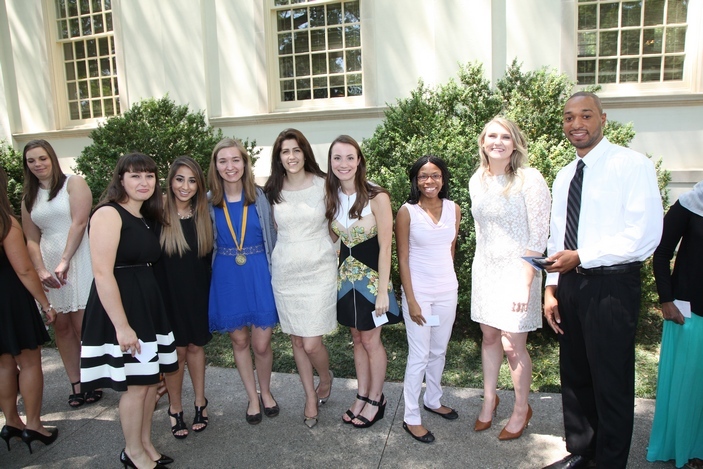 The School of Nursing’s Awards Ceremony held Saturday, May 7th at Glenn Memorial Chapel, honored students for their academic achievements and service to the community. 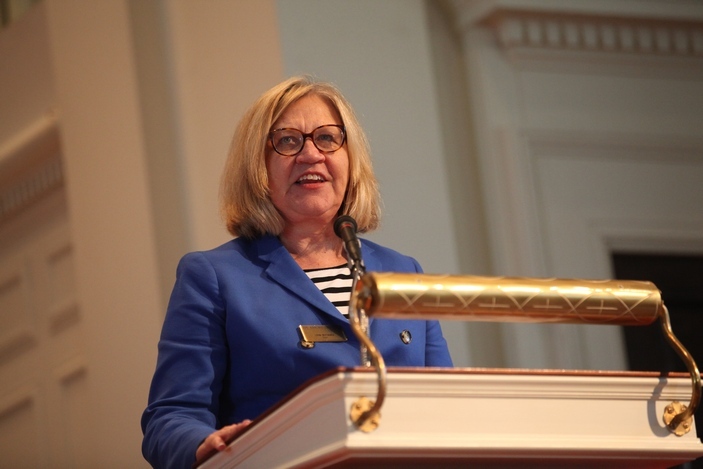 The event concluded with the presentation of the class gift to Dean Linda McCauley by Class President Tyler Hanke-Diego and Emory Nursing Student Association President Chuncey Ward. 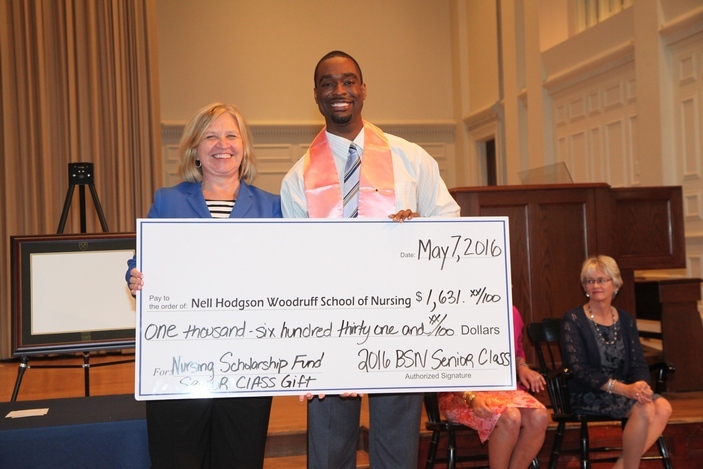 The Class of 2016 raised more than $1,631 for the Nursing Scholarship Fund to support the next nursing cohort. Seventy-five percent of the class participated in the senior campaign.